Mild-mannered Jung-won (Han Seok-Kyu (한석규) owns a small photography store in a quiet country town, whiling away his days developing pictures for the locals and spending time with his family. Yet Jung-won is also suffering from a terminal illness that he attempts to deal with in his own quietly introvert manner. His simple lifestyle changes however when attractive parking attendant Da-rim (Shim Eun-ha (심은하) visits his studio in need of urgent service, and the two strike up a subtle relationship. As they gradually begin to cross paths more and more, Jung-won and Da-rim grow ever closer to develop an intimate tale of romance in the scorching heat of summertime. 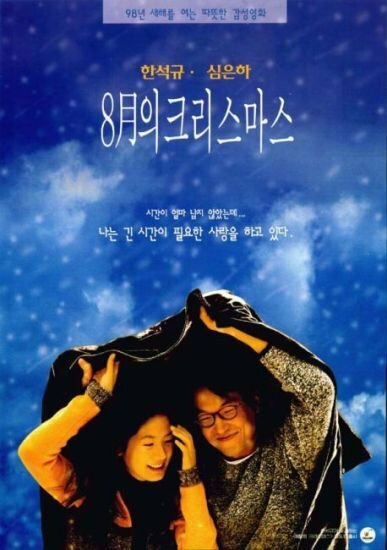 Christmas in August is a beautifully gentle and sincere romantic drama by director Heo Jin-ho (허진호). Acclaimed as something of a modern classic in Korean cinema, the film manages to skillfully sidestep the melodramatic pitfalls that so often afflict other examples of the genre to produce a wonderfully modest yet insightful tale depicting the origins of love. With Christmas in August, overblown, grandiose gestures are thoroughly rejected and replaced with smaller, more subtle moments that express so much more affection. Scenes involving Jung-won and Da-rim as they share ice creams, converse in the photography studio, and have brief encounters in the village contain a palpable authenticity that is a genuine delight to watch, as their relationship gently develops and deepens. Such instances are heavily reliant upon nuanced performances, and in this regard Han Seok-kyu and Shim Eun-ha, who were at the height of Hallyu stardom at the time, deliver wonderfully. The glances, the exchanges, the body language – all perfectly convey the fragile tenderness of adolescent romance, and as such it’s little wonder that the couple are so iconic in Korean cinema. The likability of the couple is also due to the fascinating characterisation ascribed to each, with Jung-won as a sensitive, creative introvert and Da-rim as a headstrong, independent and feisty. Although they are quite different the attraction and intrigue that draws them together is particularly charming. Director Heo makes the wise decision not to exploit Jung-won’s illness within their burgeoning relationship for the sake of melodrama and romance. While the undisclosed illness underpins much of the events that transpire, the story isn’t subsumed by it and it’s to director Heo’s credit that he keeps scales back the drama in favour of character. Jung-won’s occupation at the photography studio is also an effective metaphor in director Heo’s exploration of love, loss and time. The different situations in which he takes pictures or edits the images for customers is consistently touching as it gives his life purpose and meaning in the quiet country town. The creation of something that will endure beyond his time on Earth conveys his poetic nature, even though he is aware that ultimately everything fades. Christmas in August is considered a classic of modern Korean cinema, and for good reason. Director Heo Jin-ho explores the origins of love with incredible sincerity, never allowing the story to delve into melodramatic cliches and prizing characterisation and subtle, tender moments over excess. With charming and nuanced performances by Shim Eun-ha and Han Seok-kyu, Christmas in August is a lovely tale of love, loss and time.